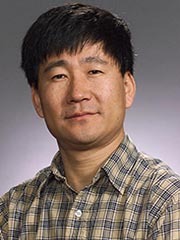 Yuguang “Michael” Fang researches and develops technologies in the field of wireless networks and mobile computing. He is also researching application of networking technologies in areas such as health care, environmental monitoring and homeland security. “To provide mobile users access to the information superhighway anywhere, anytime and in any form, wireless systems have to be designed in such a way that the resource is made available wherever mobile users need it,” says Fang. Networks such as wireless local area networks (such as Wi-Fi), wireless mesh networks, mobile ad hoc networks, and wireless sensor networks have received an immense amount of attention for their ability to self-organize. However, supporting secure, dependable communication service over unreliable networks is a difficult task. Fang and his students have come up with a new set of energy efficient protocols that support secure and dependable data delivery services over such wireless networks. Fang is also leading a team of researchers on a project called DeerNet sponsored by the National Science Foundation, to develop real-time wildlife monitoring and behavior analysis. “The idea is to build sensor networks with video sensors mounted on deer to collect real-time video for deer behavior analysis and disease control,” says Fang. The outcome of the project will have a major impact on wildlife monitoring and could help prepare the nation for potential terrorist attacks through animal diseases.